Born on: 10 March 1992 in Sofia. Education: Sofia Unversity 'St. Kliment Ohridski', student in master’s programs 'Animal Physiology' and 'Algology and Mycology'; Bachelor of Science in Ecology. Biology and distribution of the cave fungus Pseudogymnoascus destructans, distribution, biology and ecology of bats, biospeleology, science communication. Visiting scientist; Advisor: Prof. Raphaël Arlettaz. Carrying out some passive listening experiments on Barbastella barbastellus in captivity. Assistant; Advisor: Dr Klemen Koselj. 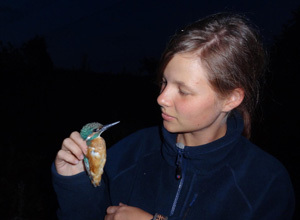 Field assistant, looking after captive bats and helping with behavioural tests. Research projects on distribution of Pseudogymnoascus destructans in Bulgarian cave and effects on bats. For the work I won a student grant from the Bulgarian Biodiversity Foundation and we successfully found the pathogen for the first time in Bulgaria.